Catch up on Part One, Part Two, and Part Three of The Climates. Summer dived off the backyard platform into the crisp, refreshing escape of the family’s backyard pool. The sound of the world muffled as she went underwater, and she appreciated a moment of peace. Teenage life is just so tough! Her parents keep hovering over her. “How are your grades?” they ask. “You won’t have a good career if you don’t study,” they say. “I don’t like you hanging out with Billy,” her dad insists. “How is Amanda? You’re still friends, right?” asks her mom. It’s just constant! There’s never a moment to just, like, escape. And her little brother. Ugh. Summer’s face broke the water’s surface and she took a deep breath. She rubbed the chlorine from her eyes, and the air-breathing world came back into focus. Her dad was trying to enchant his beehive, though from the welts on his skin, it seemed to be going badly. “And that was an oxymoron,” replied Summer. Her dad bumbles off to find his bee suit, flustered by his beloved bees’ vigor with which they swarm him. Why couldn’t they actually pollinate his garden? 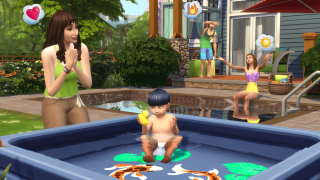 On the other side of the yard, Summer’s mom, Janine, splashed Nicolas in his kiddie pool. The little tike wasn’t big enough to swim in the pool yet, which was fine by Summer. The little turd would probably just ruin her swimming sessions. Her parents were seriously so unfair. When she was little they would always scold her for not cleaning her room. Scold her for not doing chores. Scold her for her grades. But no, not Nicolas. The baby got away with everything. But he was such a terror! Her dad stepped back outside, fully bedecked in his bee suit. He looked, frankly, ridiculous. Summer rolled her eyes before she could stop herself. “Holy bee pollen, this suit is hot!” exclaimed her dad. “You look ridiculous,” Summer jabbed. Summer walked inside in a decidedly sulking manner, dripping water all over the floor, and flopped on her bed. She slammed the door and cranked up the music, so she could ignore everyone. Her mom sounded nicer than usual, but she wouldn’t be fooled. Ugh, her dad too. It’s a conspiracy. Always a conspiracy. Her parents shushed the toddler. Why was Nicolas chiming in? Too curious to remain in a teenage mood, Summer changed out of her swimsuit and tromped downstairs. The sound was deafening, less from the volume, and more from the sheer shock of seeing her entire social circle standing in her living room in bathing suits. “But, when?” Summer was completely caught off guard. Her dad kicked the stereo and her favorite song came on. The summer heat receded with the sun, but an army of teenagers raced out the back door and leap into the pool. Janine tugged on Summer’s sleeve before Summer could run out to join her friends. Summer gave her mom a huge hug. “Not bad, eh kid?” says her dad, spatula in one hand and plate of burgers in the other, ready to light the grill. Summer grins and runs out to join her friends. Thanks for joining us and the Climate family! Check out The Sims 4 Forums, follow us on Twitter and Instagram, like us on Facebook, and subscribe to our YouTube channel. Sign up for The Sims 4 newsletter to get updates, exclusive offers, and more (including other EA news, products, events, and promotions) by email and get Grim's Goulish Guitar for free!